The Boom! Studios WWE series has been fairly consistent in recent months, so it was a shame when last month’s WWE #10 failed to continue their impressive streak, delivering a rather pointless entry into their canon. Thankfully, WWE #11 gets things back on track with an amusing, if not slightly silly outing. The comics are currently dealing with the most difficult of the three Shield members – Roman Reigns. While the other stories were fairly straightforward to tell, Reigns’ attempts at climbing the mountain were hindered not by his in-ring ability but by an unfortunate suspension for the use of a banned substance. 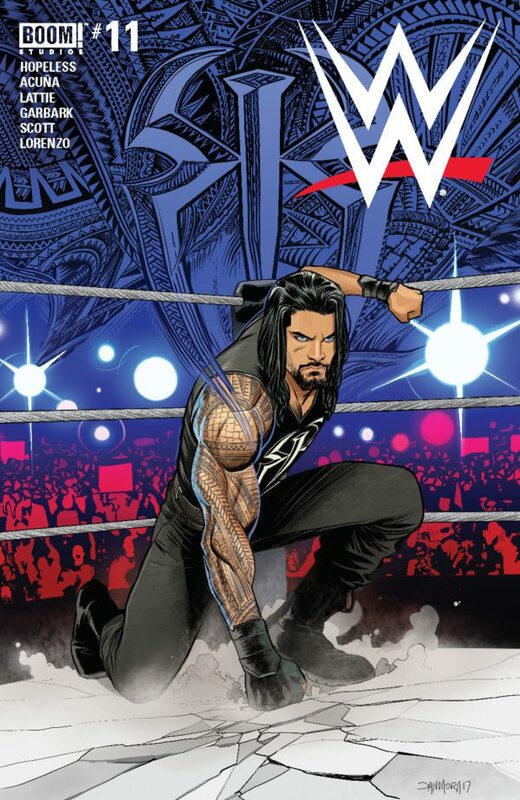 WWE #10 made a bit of a mess of this, keeping Reigns away from the ring and basically giving us an issue where he just sulked about before having a little scrap with Dean Ambrose. In this issue, Reigns is still moping about, this time in Paris, but he does end up back in the ring through a series of ridiculous circumstances. While throwing his dummy out of the pram, Reigns is confronted by everybody’s favourite superstar, John Cena. This leads to the two of them scrapping all over an arena and ultimately ending up in the ring, giving artist Serg Acuna a chance to show off those delightful square circle based animations of his. While Cena does look a bit questionable, everyone else looks pretty great here and Acuna gets the chance to show off some more of his superstars, with Sasha Banks being a standout. Talking about good artwork, the cover y Dan Mora is also one of the best in recent issues. The story itself is, obviously, ridiculous but it’s fun to read and is a clever way of dragging out Reigns’ suspension. The issue’s backup story ‘The Viper’ is a strange little addition to the comic. It’s a two-page piece about Randy Orton wrestling Eric Rowan, of all people. Again, the artwork here by Rodrigo Lorenzo, who worked on the ‘Debut’ story in the recent Survivor Series Special is nice, with Rowan looking pretty impressive and some nice artwork featuring some bulls, but the story itself just seems to have no relevance.